On my first visit to UCF, I knew this was a special place. There’s something about the particular combination of being in Central Florida, the kind of students we attract and the people who choose to work here. There’s something, too, about the qualities we share that make us Knights. When I think about our mascot, I think about how it could have gone another way. Sure, people talk about Vinnie the Vulture and the Citronaut, but those were never real contenders. Former president Charlie Millican assured me of that. But there was a fairly serious discussion early in my presidency about changing our mascot from the Knights to the Sharks. You see the Knights everywhere now, but you didn’t back then. And if the idea of becoming the Sharks had attracted enough attention, we might have made the switch. But we didn’t. We are not Sharks. We are Knights. And I’ve done a lot of thinking over the years about what that means, and why I’m proud to call myself one. Knights look for opportunities to serve. Our students, faculty, staff, alumni and supporters are some of the most remarkable people you’ll ever meet. From teaching to research to community service, Knights are changing lives here at home — and around the world. I think of Pulse and Hurricane Irma as examples of this. Knights were there helping in the immediate aftermath of the shooting at Pulse — from our own police department to nurses and doctors — and continued to help victims heal in the months that followed. After Hurricane Irma, we opened our campus to the National Guard so members could easily reach people who needed assistance. Knights were also emergency staff on call, they were neighbors helping neighbors, friends helping friends. I’m continually impressed by the UCF community, but never more so than when you’re willing to help during a moment of need. Throughout our work, it’s as if each of us is asking, “What is the right thing to do? And what do I need to do so that the next person can succeed in his or her job?” There’s something about the qualities we all have in common — working together to do what’s right — that make us Knights. That’s the modern-day version of a knight: You do what has to be done, and you try to do what’s best for all. I’m proud to have always tried to do the right thing for UCF, and as I move on from the presidency, I’ll remain a part of the university. I’ll have an office in Research Park and will be working to successfully close out our $500 million IGNITE campaign. My focus will be on raising funding for more faculty positions and support for our faculty members. 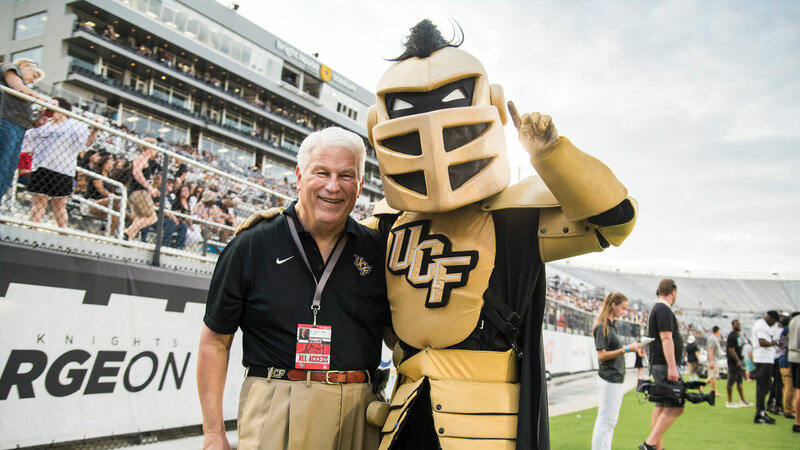 Faculty are the lifeblood of great universities, and that’s especially true for UCF. With them, we increase our excellence in teaching, research and reputation. When I arrived in Orlando, UCF was a place full of potential. It still is — because our students, faculty, staff and alumni are full of potential. We turn big dreams into reality. We challenge what has been by pioneering what’s next. We know that if we put our minds to it, anything is possible. And that’s why I will always be a Knight. No matter what.